This one comes to us from Luke Roland. I have always loved Christmas. This time of year is what I looked forward to for much of my life. I love everything about Christmas. Movies, decorations, music, food, Santa, gifts, and more food. My family Christmases growing up were near picture perfect. My mother and father went all out and made home a magical and fun place for my sister and me. I wouldn’t change anything about it. This Christmas will be like no other Christmas I have ever experienced in my life. I have two children, and I’m currently going through a divorce. It is the first year I will spend Christmas Eve alone, away from my children. This is the first Christmas that Santa will be coming to two houses. This is the first Christmas that my children will ask Santa to bring things to mommy’s house and daddy’s house. I didn’t ask them to do that. They told me that when they see Santa they will ask him to bring certain things to certain houses. I don’t know what to say, but ok. I don’t feel very cheery this year. I don’t feel joyful. I’m not really all that thankful. I’m more bitter and resentful. However, I’m doing my best to fake it in front of my children. All this talk about joy and happiness is hard for me. I’m the opposite of those things. This is the first Christmas that I’m on medication for my recently diagnosed depression. This is the first Christmas that I will watch National Lampoon’s Christmas Vacation by myself. The first Christmas morning that I will wake up all alone with no nice breakfast, no presents to be opened, no sounds of children laughing, no soft feet running to my bed to tell me Santa came. Instead I will wake up depressed and angry. I will pull myself out of the ash heap of my bed, make coffee, and probably cry until my kids come around 1pm to the other house Santa brought them gifts to. I used to pride myself on having it together, but now not so much. I told someone the other day that the only goals I have in life right now is to make sure my kids are fed and get to school on time in uniform. If I do that I feel like I’m #winning. I don’t have any advice on how to survive the holiday seasons, but I recognize that it’s not all that it’s cracked up to be. Maybe alcohol? Maybe friends? Even that is not going to fix it. The wine runs out and the friends eventually want you to go home. Loneliness will set in. Christmas can be very challenging when church, music, film, and Hallmark are telling you “tis the season.” Now when I hear “tis the season,” I think law. It is surrounding us this time of year, and for those of us who have experienced any sort of loss in our life it is hard for us to be merry. We’re more Scrooge-like. I don’t have enough faith to be happy and jolly this year because I know on December 25th I’m waking up by myself. One of the things I find hard about Christianity is what I hear Jacob Smith, Rector of Calvary-St. George’s, talk about a lot. The “already and not yet.” All of God’s promises are yes and amen…psyche. I’m not alone because he promises never to leave me nor forsake me. But I am actually physically alone. He is present when I don’t feel him. Key words, “I don’t feel him.” He is here, but not like that bottle of Johnnie Walker. Genesis 28:16 says, “And Jacob awaked out of his sleep, and he said, Surely the LORD is in this place; and I knew it not.” This is what makes Christianity hard. If you skim the Psalms you will see the loneliness even though he is “ever present help in the time of trouble.” There are no easy answers or formulas to get through this. Something happened to me a few weeks ago that really affected my thinking of the tangible expressions of God and his presence. A close friend came to visit me who shares a great interest in record collecting and wanted to do some digging with me. When she came to visit, she made it clear to me that she was going to buy me any LP I wanted as a belated birthday present (how sweet!). We went to Academy Records in the East Village, one of my favorite spots, and as we intently perused the vast selections that were available, my eyes fell on The Allman Brothers Band Live at The Fillmore East that was on the wall. It was in mint condition, and a little pricey. But, I also had my eye on a nice copy of Tupelo Honey by Van Morrison. 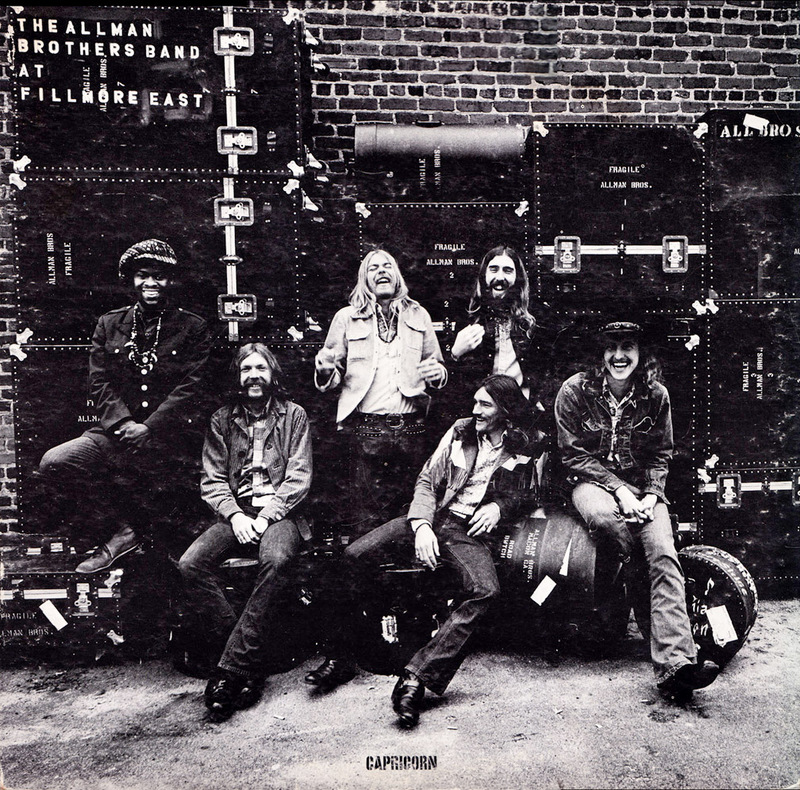 I didn’t know which one to pick, but I finally decided on The Allman Brothers Band (tied to the whipping post!). She paid for her records and mine and we made our way out the door. When we stepped back out on East 12th street she pulled out the Van Morrison LP and said here you go. I was floored. Not only did she buy the Allman Brothers LP, but the Van Morrison as well. Her generosity left me speechless. For the rest of my life when I play those my mind will be flooded with thoughts with her. She’s there, but not yet. I’m thankful that during advent communion is still served. The bread and wine is received in remembrance to say to me and you that you are not alone. He is present in that moment. Every time those records go on my turntable I remember, and every time the priest puts the bread in my palm and says “this is the body of Christ”, I remember he is here. I’m alone, but I’m not. For right now that is how it has to be. oh my gosh, your friend’s generosity made me cry. what an incredible experience. thank you, Luke, you are truly lovely, and your writing is helping me make it through a rough day. Luke, this is so good. Thanks for writing it. You have no idea how timely and necessary this was for me. The very day this posted followed a meeting in which I tried to defend this very point concerning our inability to functionally trust God as we should. My colleagues (good friends and well meaning) somewhat snubbed and derided my take on this matter (and I even referenced psalms as you did – 44 and 89 to be exact), and insinuated I was being fatalistic, defeatist, however you want to phrase it. Anyways… reading your piece confirmed that I’m not crazy after all. We do at the experiential level doubt God is really near and cares. Enjoy your records! By the way, as far as specific records reminding you of specific people – whenever I hear The Smiths, I always think of the time in my life when I was unsaved, living in a small dorm, and these two Christian guys (one actually named Christian) would visit from time and time and swap Smiths CDs with me. Though they on a few occasions would invite me to a Bible study (which I always politely declined), the one visceral and meaningful connection we had was The Smiths ‘Hatful of Hollow’ and ‘Best of…’ Ha! Wish I could reconnect with those guys now! To take DZ’s advice from the Manchester comment, let’s not pretend every loss can be redeemed. But you sharing your feelings helps me see my own. I am going through a divorce with two kids also. Just said to a friend that this is my first Christmas alone. Strange how I saw this post in my news feed, and clicked on it.Divine intervention I suppose. Thank you for this. Thank you for writing this…a theme which so many of us can relate to. It reminds me of the kind of raw honesty I’m so thankful to get in 12-step recovery–not in most church settings, sadly. And yet what’s missing in 12-step is the promise of the unfathomable and personal love of Jesus. I’m glad I can do both. I wish I got them together. Anyway, you’re not alone. But it hurts. So much. Thank your for being honest and saying so.